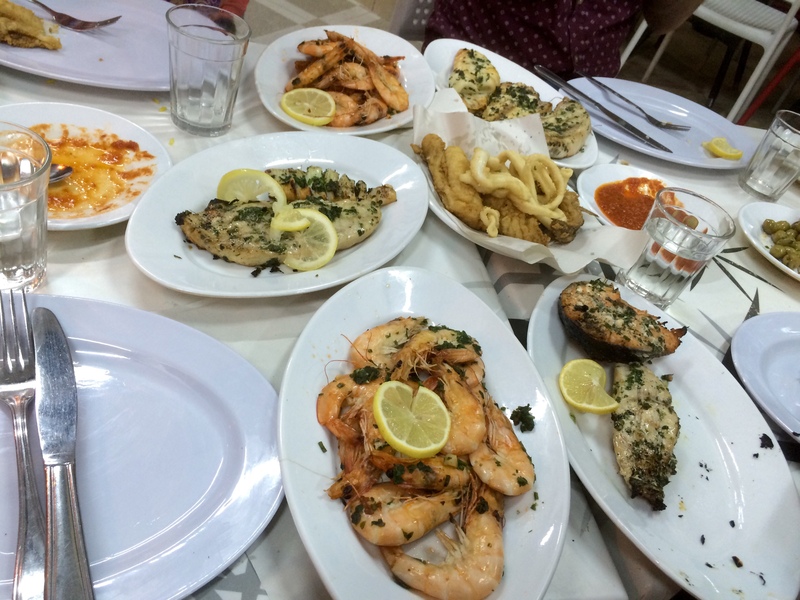 ← Tuesday 28th October – I see McArabia on the menu and I’m licking my lips. Meet Andrea and Jacob. A bubbly couple staying at the same Riad with us in Marrakech. Teachers in London this is their school break and they’re exploring to the max. They report back giving us tips on places to eat and what to watch out for. They are also travelling with carry on only and wouldn’t have it any other way so we have kindred spirits there! I think I’ve said it before but the people we meet has certainly been a huge highlight in these travels. Katy has told us about the fish restaurant that she can recommend and we decide to go together. Andrea knows her way round like a tour guide and we are happily taking a back seat while these two navigate streets with names written only in Arabic. Once we get there it’s a bustling place with almost full tables. We’re a little unsure about how this works but basically you pick what you want. They weigh your selection and then cook in your preferred way. We chose a couple of white fleshed fish that we don’t know, a hunk of salmon, squid and fat succulent scampi to be grilled. Then you go back and wait while it’s prepared. While you’re waiting they give you a small dish of steamed rice and a salsa kind of dish and a bottle of water. We chat about schools in NZ and particularly special needs which is the field these two work in. It’s interesting hearing about the pros and cons of integrated or stand alone units. They seem to be using every holiday they get to explore somewhere new and this is abreast stage of life to be doing it….and then the plates arrivé! To say it was delicious feels kind’ve like an understatement. It was as fresh as fresh can be and tastes of a smokey BBQ come thru with fresh coriander. I would go back tomorrow and do it again. It was that nice. We wander back in the cooler evening air with the streets much quieter. Shops are closing up. A few men playing cards. Children still out and about, just less of everything really. There’s still quite a bit of activity though and as we turn to our street there is some kind of procession complete with drums. Did I tell you it was about 11pm? It’s been a lovely evening. There’s a threat of rain and the air is cooling, which is good and we slip into bed feeling very full and content. Breakfast is our cereal and a pomegranate I bought at the markets. Pomegranates will always remind me of Morrocco and it’s cool we are here in their season. I have no idea how you tell these things are ready but I feel this is not at its best being no where near as nice as those we had in Fes. No matter. I separate and sprinkle over my breakfast and decide to have a nice restful day in. We lounge around nibbling on dates we bought in the Draa valley on our way through. This is date season as well, and the fresh nuts we bought. We leave on the train in the morning so this is the last we will see of Marrakech. 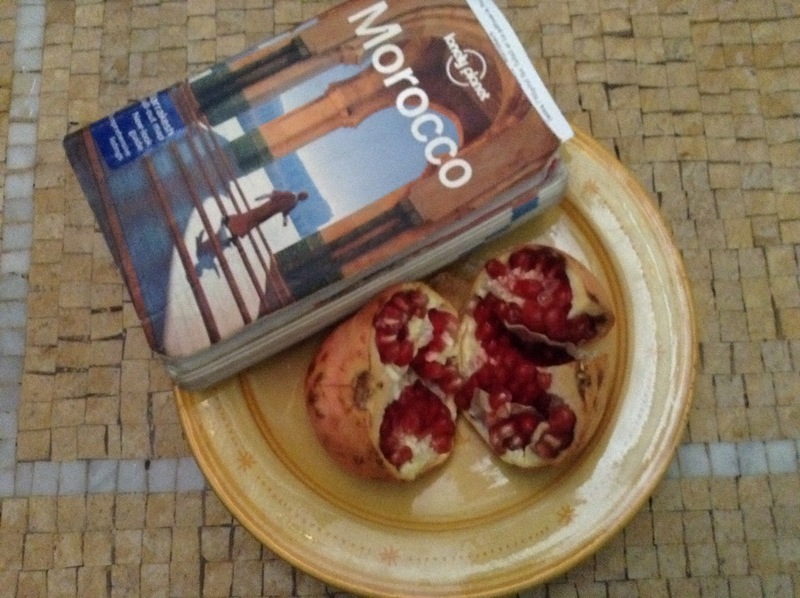 I’m remembering how much I wanted to see Morocco when we started to plan. How I read and heard it was not that safe for tourists alone, and guided tours were better. Lauren told me to wait until we hit Spain to think about it. We would be way more travel savvy and would have been talking to other travellers and see how we felt then, which was the best advice. We decided Morocco is perfectly easy for travellers. Andrea told us of a couple they met who were too scared to go out and just sat inside all day. I guess it comes back to being realistic about what your comfort level is and I can see how daunting stepping out there is. Our experience in China gave us a very good grounding for here as it’s different, but the same in its intensity. 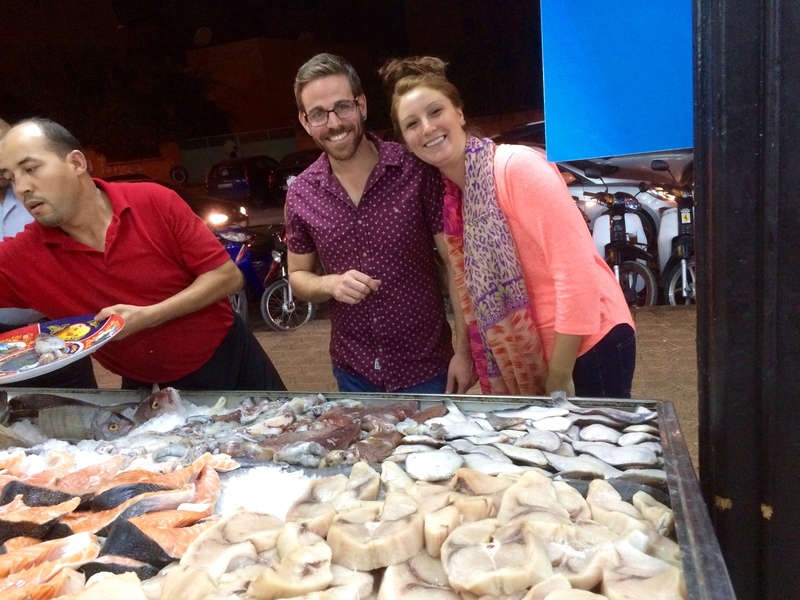 Andrea told us about a full on fight they witnessed just outside our Riad and we told them that with the extreme poverty and close living we had seen we were surprised there hadn’t been more fights in Morocco…until we arrived in Marrakech. We witnessed five altercations in our first half day here, where we had seen harsh words spoken once in Fes only. Here the tourist numbers are huge and the street sellers are in stiff competition. In Fes the selling is gentler and more fun. They still don’t want you to leave without buying, and we had times of frustration, but in general it was more reciprocal goodwill. Here is more aggressive. They seem to be on a time limit. They want you to buy, and buy now so they can get onto the next sale. You feel like you are fresh meat just arrived and there is almost a frenzy out there. 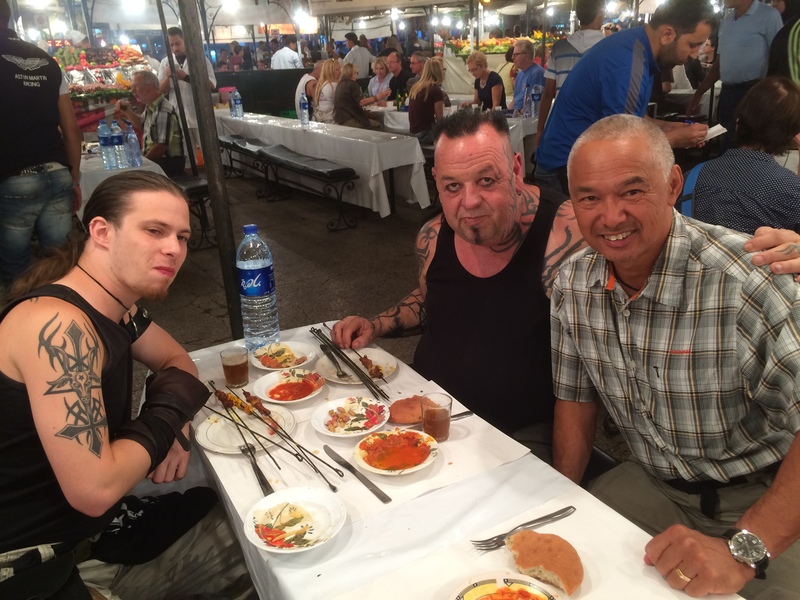 I haven’t enjoyed Marrakech half as much as Fes but I’m glad we are here. We don’t head out until 6pmish to find some dinner and I really want to go to see the belly dancing so wander through some different alleyways to fill in time. It’s good not to be shopping. Just enjoying. We wander through the market place and take a video so we can remember the size and noise. Id guess there must be about ten thousand people in here. You can hardly move. Tourist buses are lined up. Gilbert says it’s pretty safe here really. We haven’t heard of anyone getting pick pocketed. We haven’t felt unsafe at anytime. We have to say it’s been a good stop in Morocco. We have dinner and sit with a couple of German guys and have a good chat about Germany and NZ and then bid each other goodbye. Gilbert pays the bill and because we are just filling in time before the show, we are kindve relaxed and just wandering when Gilbert feels his pocket and realises his wallet is missing. We check and double check and I ask him if he felt jostled at any time cause I can’t recall anything when it might have happened. He thinks a bit and then remembers a couple of young teen boys. One was walking along with his phone to his ear and ‘Inadvertently’ walked in front of Gilbert. Which meant his friend got pushed up close beside Gilbert. Everyone apologised all round and we went on our way. Yep he was jostled, and so slick he was completely unaware that his wallet in his velcroed pocket on his lower leg is gone. I think they must have been watching when he last paid and followed us. I wasn’t even aware it had happened. We head straight back and Gilbert phones the numbers we have to stop the cards and it should all be fine. I get off the phone for my part and said to Gilbert “gee the Moroccans are hard to understand on the phone.” “He wasn’t Moroccan, Gilbert says. He was in NZ.” Oh well, only $30 in there in MAD, so apart from the bad feeling and hassle we’re still good. I have my cards and some cash and it’s a good time to be leaving. Just under two weeks to go. It’s countdown!